Mites are common external parasites, which look like dark mobile specks to the naked eye. Some are blood suckers, while others feed on the birds' skin, scales or feathers. Mites are a source of irritation for poultry, and heavy infestations can cause poor health, decreased egg production and sometimes death. It's important to know what to watch for, so the birds and their environment can be treated appropriately. Consult your veterinarian for guidance on treatments. Northern fowl mites (Omithonyssus sylviarum) generally attack chickens, turkeys and game birds -- less commonly, ducks and geese -- in temperate climates. Younger birds tend to be more affected than older poultry. These black mites -- which are red after feeding, as they're blood suckers -- complete their whole life cycle on the birds. The mites can be found on eggs or seen on the birds, by parting the feathers, around the birds' vents, under their wings and high on their legs. With heavy infestations, the birds' skin may be cracked and scabby around their vents, they may become anemic -- with pale combs -- eat less and quickly lose weight. Egg production can go down by 10 percent. Northern fowl mites are usually a problem during the winter and when it's cooler in the spring and fall. Chicken mites (Dermanyssus galline) -- also called red mites, roost mites and poultry mites -- infest chickens and turkeys, but are less of a problem with ducks and geese. Chicken mites are black, turning red after feeding, as they are nocturnal blood suckers and will only be found crawling on the birds' skin at night. If birds are suddenly reluctant to go into their coops at night, this can be an indication of a chicken mite infestation. In the daytime, chicken mites can be found -- usually in clusters -- on roosts, in nest boxes, cracks and crevices in hen houses and under manure. 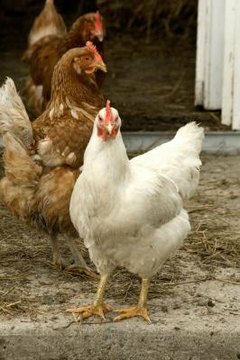 Infested poultry may become anemic, with pale combs and faces, and with heavy infestations, young birds can lose weight, egg production may decrease and birds sometimes die.Chicken mites tend to be more of a problem during warmer months. Depluming mites (Neocnemidocoptes gallinae) attack chickens, pheasants and geese in spring and summer. These tiny mites live at the base of the birds' feathers, burrowing into the skin. They appear to cause such intense irritation, affected birds will pull out their feathers. The stumps of the broken feathers are usually surrounded by scales and crusts if they're examined shortly after the quills are broken. The burrowing activities of depluming mites can also cause skin lesions and digit necrosis -- where body tissue dies due to lack of blood flow to the tissue. Scaly leg mites (Knemidocoptes mutans) are too small to see with the naked eye. They cause irritation by burrowing into the skin, where they feed on connective tissue, under the scales on chickens' and turkeys' legs and feet. The first sign of scaly leg mites can be a flaky or powdery look to the birds' legs. The scales may become raised, with the legs covered in scabs and crusty lumps. The birds' legs can double in size and develop joint problems that cause lameness. With severe infestations, it's possible for toes to fall off due to necrosis. Scaly leg mites occasionally affect the birds' combs and wattles.